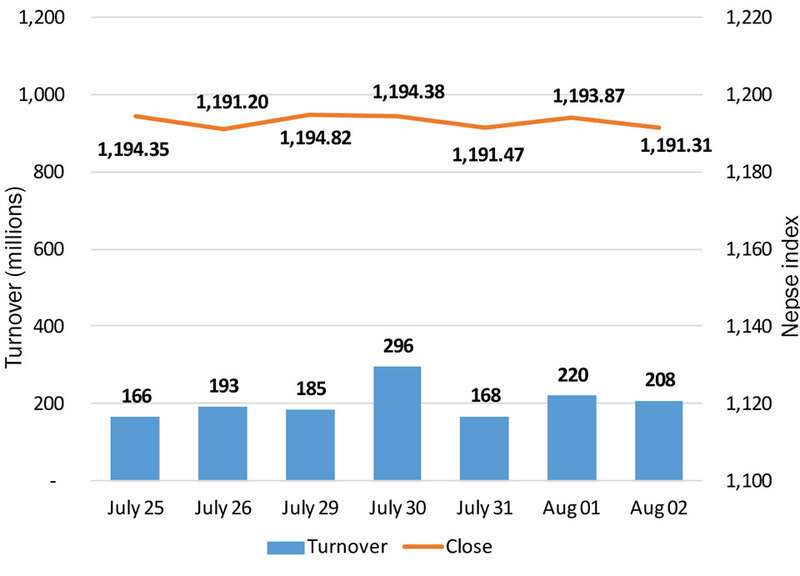 KATHMANDU, Aug 3: Stocks traded mildly higher in the beginning hour of Thursday’s session. However, the market failed to hold on to the initial gains and traded mostly in the negative territory later in the session. Despite a slight pullback toward the end, the benchmark Nepal Stock Exchange (Nepse) index closed 2.56 points to end the week at 1,191.31 points. With this dip, the index has continued to trend in a narrow range between 1,190 and 1,195 points for a seventh consecutive session. Recent market turnovers also suggest that the bourse has further prolonged its lackluster trading spells. 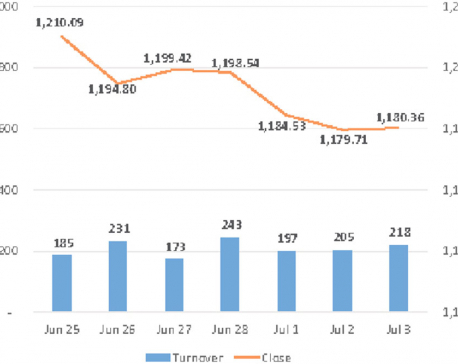 Over Rs 207 million worth of shares changed hands on the last trading day of the week. Most of the key sub-indices shed values on Thursday. Only Banking and Manufacturing & Processing sub-indices managed to eke out gains. Non-life insurance stocks were the biggest drag as its sub-index fell by 0.97 percent. ‘Others’ sub-index also closed 0.62 percent lower. Furthermore, Development Bank and Life Insurance sub-indices were also down 0.58 percent and 0.44 percent, lower respectively. Among active stocks, Sanima Mai Hydropower Company Ltd posted the highest turnover of over Rs 32 million on the day. Secondly, Civil Bank Ltd Promoter Share registered a total transaction of Rs 12 million. Shares of Global IME Bank Ltd were also actively traded after the bank published its earnings report for the fourth quarter of Fiscal Year 2017/18, posting a net profit of Rs 2,156 million compared to previous year’s Rs 2,006 million. Over Rs 10 million worth of the bank’s shares were traded on the day. Life Insurance Company Nepal Ltd and Nepal Investment Bank Ltd Promoter Share were among other active stocks in the secondary market. Best Finance Company Ltd was the day’s top gaining stock as its share price advanced by 4.08 percent after hitting an all-time low of Rs 98 per share on Wednesday. Progressive Finance Ltd followed suit with its share price rising by 3.64 percent. Shares of Khanikhola Hydropower Company Ltd, Ngadi Group Power Ltd and Global IME Bank Ltd also gained over 2 percent each. Conversely, shares of City Express Finance Ltd continued its freefall for a fifth straight session, losing almost 10 percent on Thursday. Besides, stocks of Gurkhas Finance Ltd, Mithila Laghubitta Bittiya Sanstha Ltd and Green Development Bank Ltd also fell over 3 percent each. Among companies publishing earnings reports, Excel Development Bank Ltd reported a modest growth of 4.09 percent in its net profit. Its unaudited net profit for FY2017/18 stands at Rs 156 million. Similarly, Swarojgar Laghubitta Bittiya Sanstha Ltd has published its earnings report for the fourth quarter, posting 28.9 percent year-on-year growth in its net profit to Rs 36 million. ARKS technical analysis indicates that the Nepse index’s trading range has continued to narrow down for over a month. This evidently reflects the state of indecision faced by the investors lately. In the present context, investors are suggested to watch out for a possible breakout of 1,200-point level with significant turnover which can present a profitable buying opportunity in the short run.